Picturesquely perched on the side of the Ayung river valley inland from Sanur on Bali’s sunrise coast, meticulously maintained, 4-bedroom Leha Leha comes with a teardrop-shaped swimming pool, master bedrooms with private plunge pools, a two-storey living pavilion boasting sea views and an excellent staff team including cook and manager. Leha-leha is a Javanese word whose literal meaning – being empty-minded whilst lying prostrate gazing at the sky – quite beautifully sums up the experience of staying in this secluded property. Serenely situated on the side of a vertiginous valley above the sacred Ayung River, Leha Leha is a place to relax and daydream to your heart’s content. 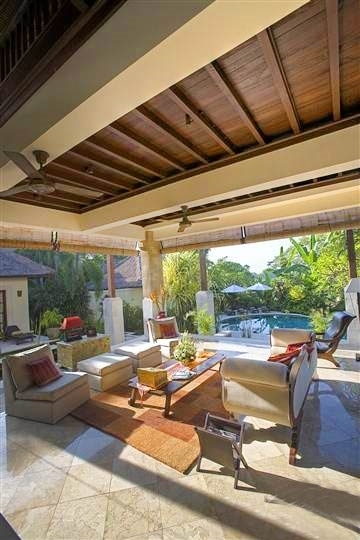 The property’s peaceful position is hidden from view by a protective curtain of verdant greenery offering an outlook more reminiscent of a tropical rainforest canopy than a river valley just inland from the coastal village of Sanur. To assist you in your empty-minded prostrations are a plethora of deeply cushioned lounging spots. Most of these can be found in the breezy open-air living rooms of the two-storey, pond-encircled central pavilion, but the four individual thatched bedroom pavilions provide yet more space for individuals to find their own peaceful pocket if so desired. Each bedroom has its own TV, DVD player and music system, and the two master bedrooms offer the added delight of private plunge pools lazing on greenery cloaked front terraces. The main greenstone-tiled swimming pool rests like a teardrop alongside the jungle-clad valley, its tantalising azure waters the perfect antidote to a hot and steamy day. Exotic scarlet umbrellas shade loungers to one side of the pool whilst to the other is a sunken bar roofed in ironbark shingle that holds great potential for sociable, fun-filled times; family photographs on display inside the villa confirm that this has often been the case. Leha Leha comes fully staffed including a housekeeper, cook, and a pair of managers who look after the villa and are able to assist in making any arrangements; from doing your shopping and laundry to booking tables at restaurants and preparing the villa car for airport transfers and excursions. 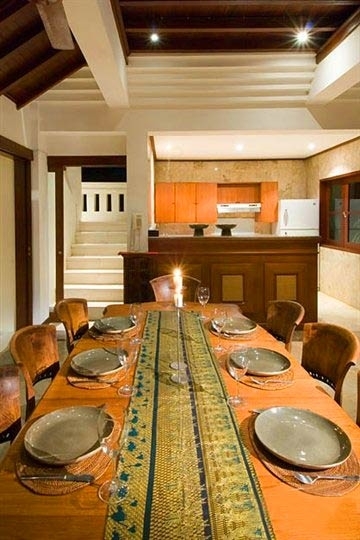 The cuisine on offer is Indonesian (cost price) however the property comes with a fully equipped kitchen, and for special occasions, an Italian chef can come and cook for you (extra fees apply). 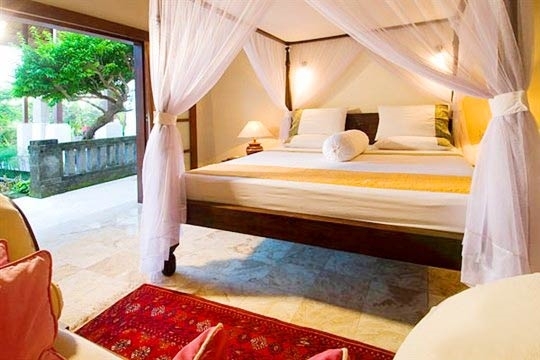 The villa is tidily kept, clean and the soft furnishings flush with colour. Leha Leha is meticulously maintained, and looks as good as new despite it being ten years old. Granted the kitchen has been upgraded in the last two years but the rest of the villa is tidily kept, beautifully clean and the soft furnishings flush with colour. Judging by the photographs scattered around the property this is a cherished holiday home. It is independently run by the owner with the assistance of two resident managers in charge of handling guest relations both of whom we found to be polite, knowledgeable and able to speak good English. Pickups from the airport were included in the rate, and a car with driver (one of the managers) was available to us throughout our stay (first tank of petrol free). 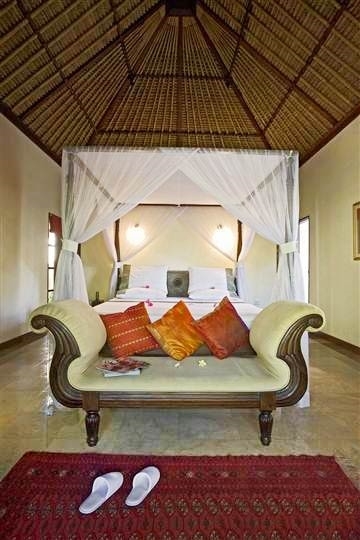 Since there are two master bedrooms, we felt this villa would be great for two families holidaying together as well as for groups of friends or one extended family. The dual storey pavilion certainly maximised living space, although in absence of ceiling fans the upper floor lounge tended to get quite hot during the day. 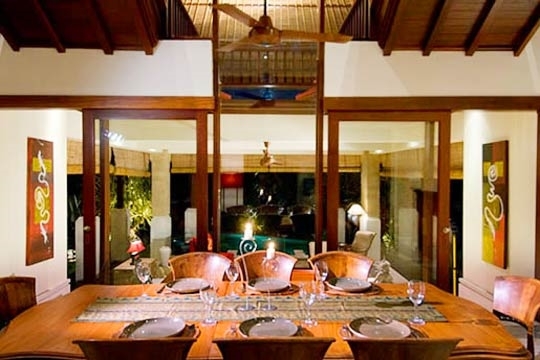 The villa’s proficient resident cook offers Indonesian fare – though ordering in or dining out at one of Sanur’s many restaurants increases your options. It’s also possible to arrange for an Italian chef to cook for you at the villa, but fees are quite steep ($150-200 plus grocery costs), so we felt that this option might be best saved for a special occasion; that said, he is very highly recommended in the guest book so perhaps it’s worth the extra splurge! We really loved the swimming pool whose attractiveness was heightened by the encroaching jungle and functionality maximised by a shallow section ideal for children as well as the pool bar. We also liked the multi-levelled lounge pavilion that offers a choice of sociable gathering spots. Villa Leha Leha is a smart property and very well maintained. Children are welcome at Leha Leha and will love it, however parents do need to keep an eye on them around the pool as there’s no boundary aside from the vegetation that slopes down the river bank; and they’ll also have to keep their eyes peeled around the edge of the ground floor living pavilion as it is encircled by an unfenced pond. 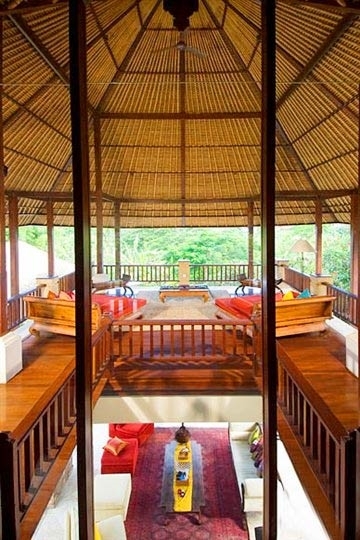 Villa Leha Leha is situated on the edge of a steep-sided valley below which the Ayung River makes its steady flow to the sea. The property is neighboured by other village homes whilst across the river are a few villas, though only their roofs are visible amongst the rich green vegetation. The atmosphere is laid back and rural with Sindhu beach and the sleepy village of Sanur less than a ten minute drive down the road. 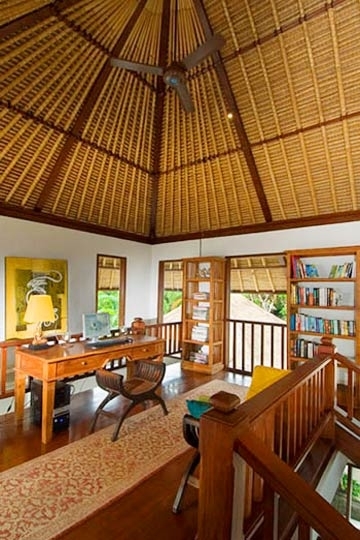 The airport, shops and restaurants of Seminyak and cultural town of Ubud can all be reached within a 30 minute drive. At Leha Leha’s heart is a giant living pavilion that magically rises above a fish-filled pond encircling the building on three sides. To the rear of this pavilion, just across the main threshold, is the dining room and kitchen from which steps lead down into the living room and up to the first floor lounge and study. Flanking the living pavilion to either side are four double bedrooms independently housed in their own thatched pavilions, whilst to the front languishes the swimming pool. Leha Leha’s dining room seats up to eight guests comfortably within air-conditioned coolness or under the gentle whirr of a ceiling fan. The dining room is attached to a fully equipped marble-topped kitchen (upgraded 2008). A pair of Palimanan stone stairways lead down from the dining area into the fan-cooled living room which is open on three sides and furnished with sofas, lazy chairs, lamps and a coffee table atop shiny marble floors, plus a cabinet that conceals a 42-inch flat-screen satellite TV with DVD player and Bose sound system. 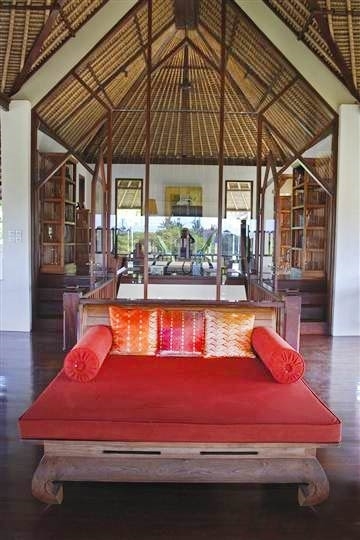 Above the living room and accessed via a stone staircase is a spacious, open-sided lounge with teakwood floors, a soaring thatched roof and a pair of deep cushioned opium beds perfectly placed to enjoy views over the valley and out to the ocean beyond. Glass doors lead into an air conditioned study where a teak desk, topped with a computer, gazes beyond the lounge through a floor-to-ceiling cathedral window. A collection of books and magazines fill shelves whilst a side door leads onto a rooftop terrace. To either side of the living pavilion are the four bedrooms, with the two master suites at either end of the swimming pool directly overlooking the verdant valley. Each bedroom comes with air conditioning, ceiling fans, a queen-size four-poster bed, plentiful cupboard storage space and a cabinet hosting a 32-inch flat-screen TV and DVD player. For musical pleasure, there are Bose iPod docks in the master bedrooms and CD players in the two remaining bedrooms. 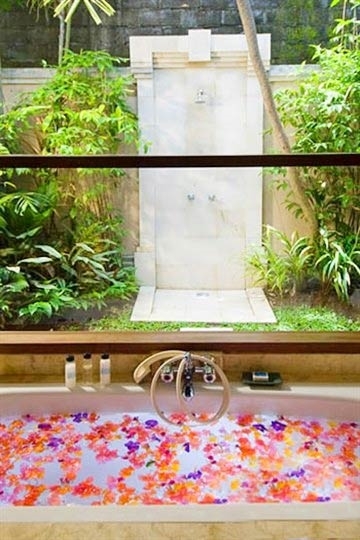 Bathrooms feature tubs, twin washbasins and both an indoor and outdoor shower in pretty private courtyard gardens. 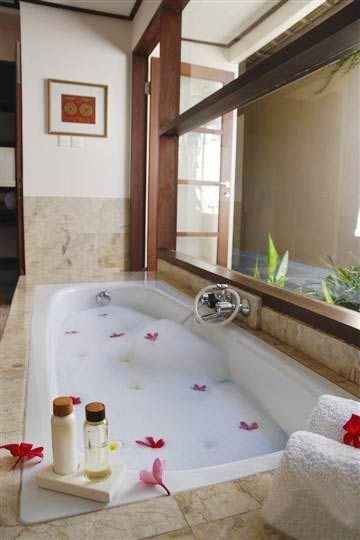 The two master bedrooms come with their own private terraces to the front with lounge seating and sunken plunge pools. 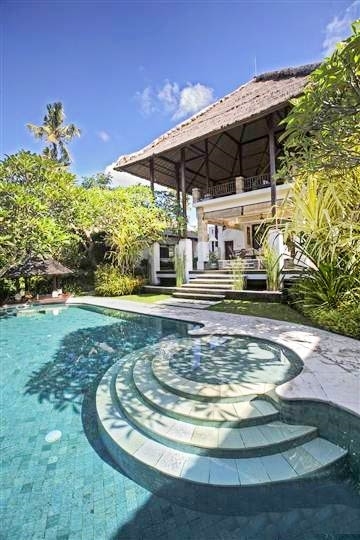 4 bedroom villa located in Sanur-Ketewel, Bali. Ideal for Beach in ten, Body and soul, Bring the relatives, Kid friendly, Fair share for groups.